Felicia vs Jon Talbain in Darkstalkers 3! This fan art by Fernando Carvalho is actually from 2009 already and was drawn by him in the hope to make it into the Darkstalkers Art Tribute Book published by UDON. For reasons unknown to him..me and a lot commenters of this it did not make it into the book though. But at least its here now. 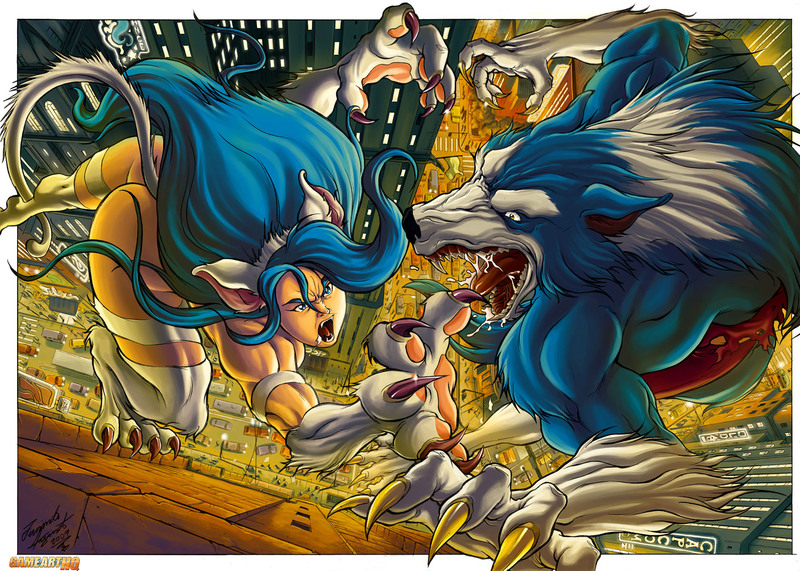 Felicia and Talbain are the Cat and Dog in the Darkstalkers games..literally even and Fernando illustrated a battle between them here with one of the Darkstalkers 3 stages (in which you look to the streets like you would be on a skyscraper) . I think its really great and deserved to be in the book. Fernando is a big fan of the Darkstalkers games as well as Street Fighter and drew a lot of great artworks related to Cammy, Juri, Makoto and many more, if you liked this piece, check out his gallery at dA too!